Secretary of the Navy, Donald C. Winter announced on May 7 at a ceremony in Lake Ronkonkoma, N.Y., the name of the newest Arleigh Burke-class guided-missile destroyer will be USS Michael Murphy. Designated as DDG 112, the name honors Lt. Michael Murphy who was posthumously awarded the Medal of Honor for his heroic actions during Operation Red Wing, in Afghanistan on June 28, 2005. “Michael Murphy’s name which will be forever synonymous with astonishing courage under fire will now be associated with one of the U.S. Navy’s most technologically advanced, most powerful and most capable warships,” Winter said. This will be my only post on this day. Here’s to a friend of our country and a friend of all that is good in this world. Here’s to the strength of one of our best cut down on the battlefield fighting against insurmountable odds. Here’s to a man who though wounded and under fire still took the time to say “thank you” before hanging up his satellite-phone after calling for reinforcements against the 30-40 Taliban his four person team was fighting. Here’s to a man who showed mercy and died from it, without regret. 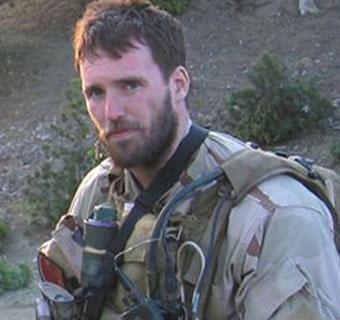 Lt. Michael Murphy, Navy Seal has just been awarded the Congressional Medal of Honor, the highest honor in this or any other land. Celebrate his life, his virtue, and his courage today, as will I. Toy guns to be sure, but demonstrators carrying guns while wearing fatiques after the two campus massacres is a bit in poor taste, and I suspect these idiots are doing more to harm their cause than aid it. Stop by Zombietime to view the photos and see if you agree.